The Death Star is nearly complete—and it’s time for battle to be joined in the skies above Jedha, Scarif, and Eadu. 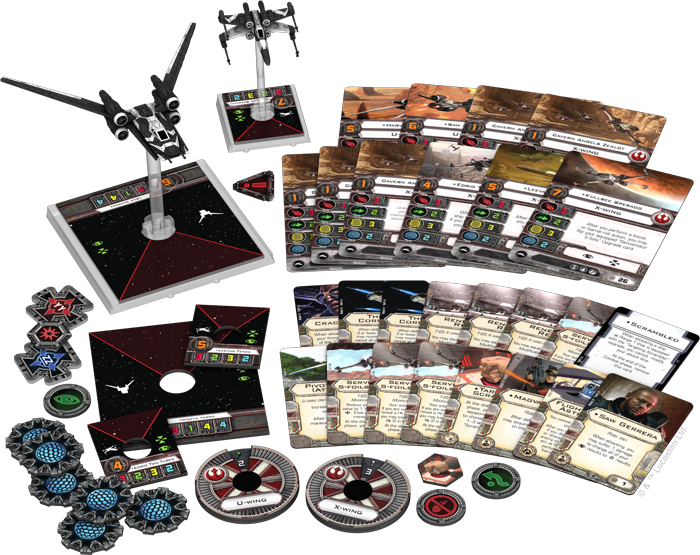 Fantasy Flight Games is proud to announce the two expansion packs that make up Wave XIV for X-Wing™! With these two new expansion packs, you’re drawn directly into the breakneck starfighter conflicts of Rogue One and the beginning of the Galactic Civil War. You may fly with Saw and his partisans, willing to fight for freedom from the Empire at any cost. Or, you may join up with the Galactic Empire and ferry your elite troops into combat in a TIE reaper. No matter which side you support, the starships and upgrades of X-Wing Wave XIV take you into frantic battles for the survival of the Rebellion and the destruction of the Empire’s ultimate weapon. You can pre-order your own copies of the Saw’s Renegades Expansion Pack and the TIE Reaper Expansion Pack at your local retailer or online through our website today! Then, read on for more information. 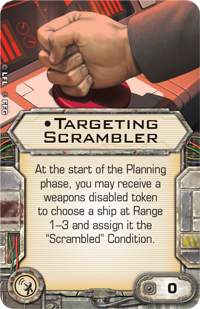 For example, you may load one of your U-wings with the new Targeting Scrambler included in this expansion pack. 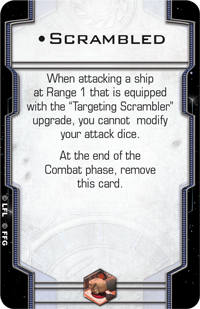 In order to devote your pilot to using the Targeting Scrambler, you’ll need to give up the chance to fire this round, taking a weapons disabled token for your own ship. In exchange, however, you can choose any ship at Range 1-3 and give it the Scrambled condition. Then, when the ship that’s been Scrambled would attack your ship at Range 1, it loses any ability to modify its attack dice! If you’re using your U-wing or another ship to coordinate the battle, you may want to keep it alive for as long as possible. Scrambling the targeting systems of incoming attackers is just one way to keep your starships around for a few more turns. With these ten ship cards and fifteen upgrade cards, plus the maneuver dials, tokens, and rules included in this expansion pack, the Saw’s Renegades Expansion Pack gives you everything that you need to take the fight to the Empire! Due to its primary nature as a troop carrier, it makes perfect sense that the TIE reaper has two crew upgrades as its upgrade slots. 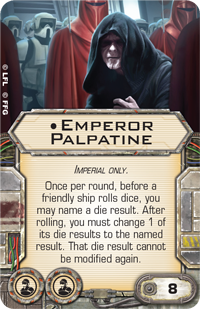 You may choose to fly Emperor Palpatine himself into combat in a TIE reaper, or you may use it as it was first deployed in Rogue One: to carry Director Krennic’s Death Troopers into combat. Death Troopers take up both of the TIE reaper’s crew upgrades, but they give you an undeniable reward for coming into close combat. 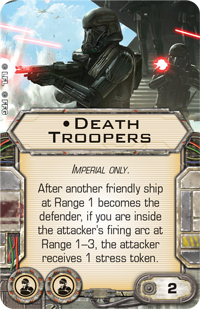 The Death Troopers card reads, “After another friendly ship at Range 1 becomes the defender, if you are inside the attacker’s firing arc at Range 1-3, the attacker receives 1 stress token.” By dumping more stress onto your opponent’s ships, you’re limiting their options and giving yourself a better chance of coming out victorious. 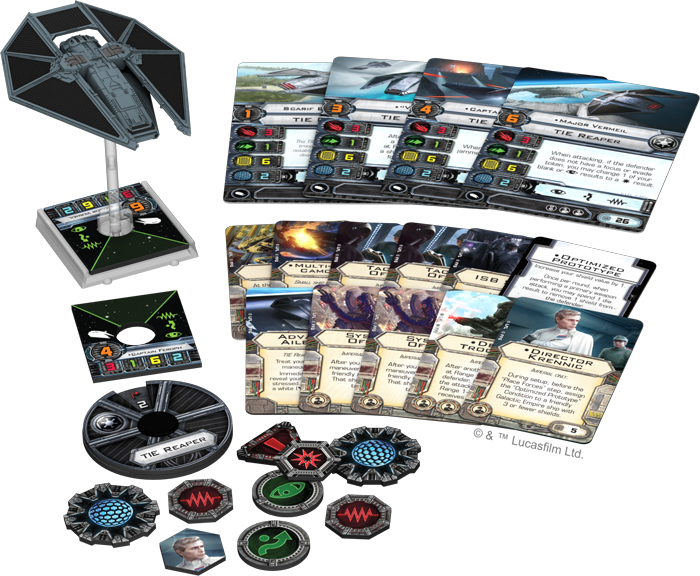 In the TIE Reaper Expansion Pack, you’ll find the pre-painted TIE reaper miniature, four different ship cards, eleven upgrade cards, a maneuver dial, and all the other tokens that you need to bring the Empire’s deadliest troopers into the heat of battle. From the low-flying infiltration of the Imperial base on Eadu, to the frantic starfighter battles in the skies above Scarif, X-Wing Wave XIV takes you into some of the most desperate and dangerous action of Rogue One. Choose your side, get your pilots to their ships, and take to the skies! You can pre-order the Saw’s Renegades Expansion Pack (SWX74) and the TIE Reaper Expansion Pack (SWX75) at your local retailer or online through our website today!